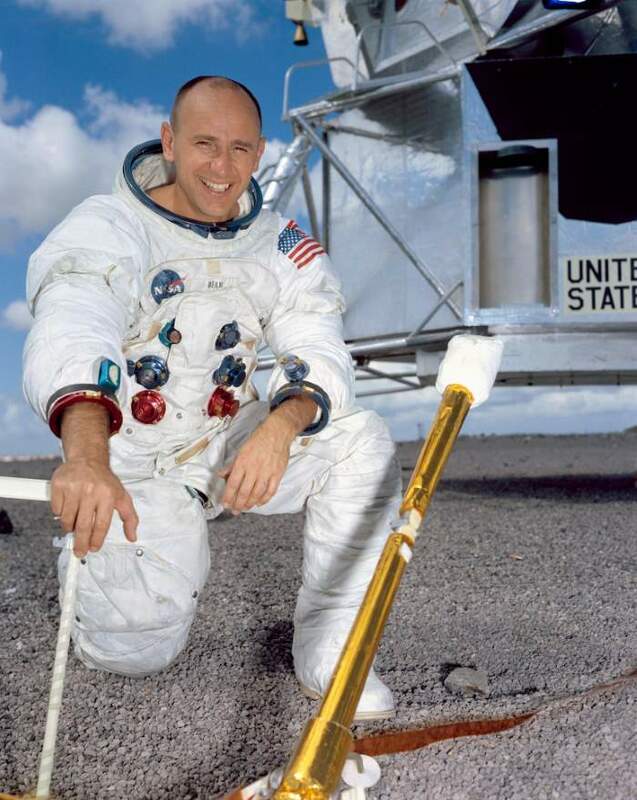 Alan Bean, the fourth person to walk on the Moon has died today (May 26, 2018). He was the fourth person to walk on the Moon: in November 1969, he spent 10+ hours on the lunar surface during Apollo 12 mission, the sixth manned flight in the United States Apollo program and the second to land on the Moon. Born March 15, 1932, in Wheeler, Texas, Bean received a Bachelor of Science degree in aeronautical engineering from the University of Texas in 1955. He attended the Navy Test Pilot School and accumulated more than 5,500 hours of flying time in 27 different types of aircraft. He was selected to become an astronaut by NASA in 1963 as part of Astronaut Group 3. Apollo 12 was Bean’s first spaceflight. He made his second and final flight into space on the Skylab 3 mission in 1973, the second manned mission to the NASA’s Skylab space station, which orbited the Earth from 1973 to 1979. During the then-record-setting 59-day, 24.4 million-mile flight, Bean and his two crewmates generated 18 miles of computer tape during surveys of Earth’s resources and 76,000 photographs of the Sun to help scientists better understand its effects on the solar system. In total, Bean logged 69 days, 15 hours and 45 minutes in space, including 31 hours and 31 minutes on the moon’s surface. After retiring from the United States Navy in 1975 and NASA in 1981, Bean pursued his interest in painting, depicting various space-related scenes and documenting his own experiences in space as well as that of his fellow Apollo program astronauts. In his 1988 book, “My Life As an Astronaut”, Alan Bean wrote: “I think of myself not as an astronaut who paints, but as an artist who was once an astronaut.” Image: A photo of Alan Bean in the National Air and Space Museum by the Wikipedia user MBisanz. Previous PostDinosaur-killer Asteroid Triggered a Global Warming which lasted 100,000 YearsNext PostHow Far Away Is The Moon?